Don’t confuse testing with checking. Checks can be automated, testing can not. When you’re testing, you’re getting to know the (new) behavior of the system. It takes human intelligence and interaction to judge whether the behavior is right or wrong — that can not be automated. 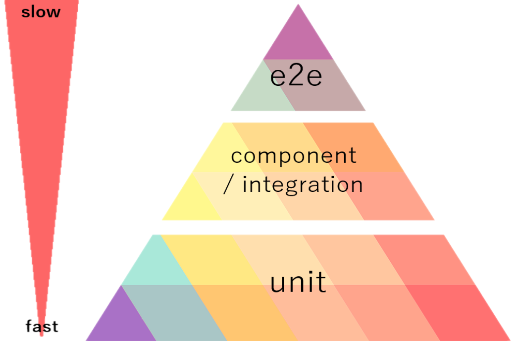 The component/integration layer tests the functional aspect of the application, and the unit tests test the edge-cases of the application. The top layer is the slowest. Use this layer to test the deployed application — ensure the components rendered and the app can launch. Use only a handful of these tests because they are slow and costly. It doesn’t make sense to test software that hasn’t changed — unless it’s properly documented. Testing documents the system so developers can change it. Automated checks are the documentation of the system and they should make changing the system easier not harder.